The Fellowes 125i is a 5.8mm Strip cut shredder and is ideal for commercial use in offices of up to 5 users, shredding up to 18 sheets at a time into 5.8mm strip cut pieces. To save energy the shredding system reduces in-use energy consumption and powers down after 2 minutes of inactivity. 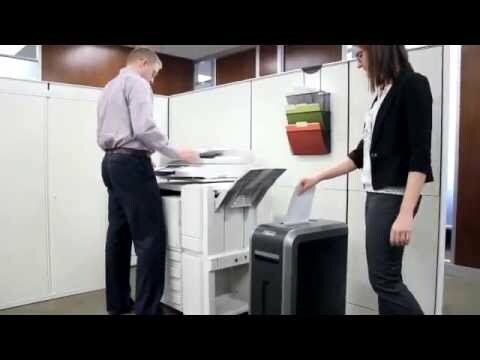 The SafeSense® technology automatically stops the shredder when touched, the 100% Jam Proof System prevents the machine from jamming and self-corrects itself when paper is not fed in properly. The slim line design of this model utilises office space efficiently, whilst still accepting A4 paper and an Auto-start and reverse function maximises the ease of use. The 49 litre pull-out waste basket has a separate waste bin for CD's/DVD's which allows waste to be segregated for recycling and SilentShred™ allows the machine to be used in a quiet office environment. Other features include an extended run time - shreds for up to 45 minutes, castors for mobility and a cable tidy at the rear. The machine also shreds staples, credit cards, paperclips and CD's/DVD's.